We Danes are known for a lot of things. Big dogs, buttery pastry, a certain young lady with a fish tail where most of us have legs. But even though Denmark seems to have this kind of eclectic brand, wine doesn’t seem to fit in this picture. But maybe that's about to change - at least global warming is working in favor of my countrymen's struggle to turn Denmark into a real wine country. It's probably only known to a few people out side Denmark, but we do actually have a EU-defined quota of vineyards of no less than 222 acres. That's less than a third of the Robert Mondavi Winery's possessions, and less than 0.005 percent of the total wine grape acreage of California. During my summer vacation in Denmark I got to visit one of the 44 commercial wineries in Denmark, called 'Lille Gadegaard' and located on the small island Bornholm far east of the rest of Denmark in the middle of the Baltic Sea. There, I was lucky enough to get to talk to winemaker Jesper Paulsen who will be harvesting his 10th vintage this year. Throughout these 10 vintages Jesper Paulsen has only bottled 3 vintages of wine, which he considers suitable for sale. The rest has been distilled to brandy except for the 2004 vintage, which was bottled and labeled 'Not suitable for drinking - works best as decoration'. To his own surprise he actually sells a few bottles of that vintage every year. At CCA we blind tasted his '2007 Syd' red wine based primarily on the Rondo variety, and though there's no doubt that the wine is well made and completely unflawed, the fruit in it just doesn't allow the wine to really excel. With the past 10 vintages in mind, Jesper Paulsen has now decided to replant his vineyard with varietals known to do well in the northern German regions with similar cold climates. 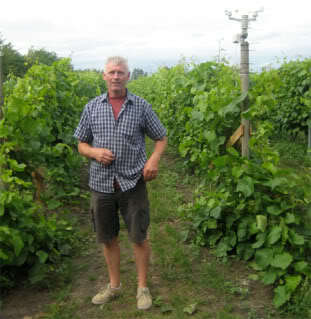 Bright summer nights On another small Danish island with the romantic name Lille¸ (Little island) another winegrower, Hans Lund Hansen and winemaker Anders Selmer have had somewhat more success doing just that by growing varietals such as Riesling, Sauvignon Blanc, Sylvaner and Solaris. The result is a beautiful dry white wine, with a floral nose and flavors of white flowers and peach. Winemaker Anders Selmer explains that what Denmark lacks in terms of warm temperatures, it makes up for in terms of light. With its northern location Denmark has long summer days and short, bright summer nights and according to Anders Selmer that's more important than warm temperatures - since it's light, not warmth, that catalyze photosynthesis in the plant. Nordic food trend It's too early to tell, whether Denmark will eventually become a real wine country. Claus Meyer, chef and co-owner of the Lille¸ Winery and the restaurant Noma, which recently was awarded the first place in the 2010 San Pellegrino 50 Best Restaurant Award, recently offered winemaker Jesper Paulsen a piece of advice. He suggested for him to make wine based on berries that grow naturally in Denmark, such as red and black currant, raspberries, gooseberries and strawberries. That's also the idea behind Noma's success: To use ingredients sourced locally and process them using a mix of traditional and modern methods to create world-class gourmet food and wine. Jesper Paulsen took his advice and is now producing sparkling wine based on red and black currant and a still wine based on strawberries. Personally, I prefer Jesper Paulsen's berry based wines, but I'm sure that with the right selection of grape varieties he will also be making great white wines some years ahead.